I got a bit tired of the tangle of USB cables under the shelf on which I place my laptop, so I decided to make myself some kind of sync station to tidy things up a bit. Being lazy, I wanted to get a container to house the USB hub and the bulk of the cables which wouldn't require much modification. I spotted a 'vanity box' in one of my favourite shops -- Muji -- which looked as if it would be just the job. It's a semi-translucent plastic box, with oval cut-outs at the side which act as handles, but also allowed me to route the cables through them without drilling or cutting any holes. I bought a lid to go with it, which has a handy lip on it, so that it stops my USB-connected items falling off the top. I've got a Belkin USB hub inside, which I raised up on four cut up pieces of rubber (by which I mean eraser, North Americans! ), as it gets very hot resting on the bottom. The semi-translucency of the box helpfully allows the LED lights on the hub to shine through, so I can tell if there's any problems with a peripheral, but it hides the worst of the clutter. Also inside the box is the USB receiver for my Logitech S530 wireless keyboard and mouse -- it seems to work fine like that. 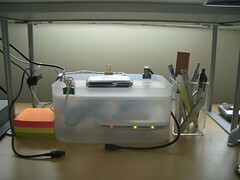 On top of the box, I placed a small USB card reader, and used bulldog clips to hold the cables in place. I've still got a few USB ports free on the hub, so I can always add a few more cables or peripherals in the future if I need to, but this serves my needs for now. I'm pretty pleased with it -- not bad for just over £5 for the materials. There are few notes attached to the image on Flickr if you want to know what's what.